Abstract: A semi-fragile watermarking scheme is proposed in this paper for detecting tampering in speech signals. The scheme can effectively identify whether or not original signals have been tampered with by embedding hidden information into them. It is based on singular-spectrum analysis, where watermark bits are embedded into speech signals by modifying a part of the singular spectrum of a host signal. Convolutional neural network (CNN)-based parameter estimation is deployed to quickly and properly select the part of the singular spectrum to be modified so that it meets inaudibility and robustness requirements. Evaluation results show that CNN-based parameter estimation reduces the computational time of the scheme and also makes the scheme blind, i.e. we require only a watermarked signal in order to extract a hidden watermark. In addition, a semi-fragility property, which allows us to detect tampering in speech signals, is achieved. Moreover, due to the time efficiency of the CNN-based parameter estimation, the proposed scheme can be practically used in real-time applications. Abstract: In this paper, we propose a novel neutral-to-emotional voice conversion (VC) model that can effectively learn a mapping from neutral to emotional speech with limited emotional voice data. Although conventional VC techniques have achieved tremendous success in spectral conversion, the lack of representations in fundamental frequency (F0), which explicitly represents prosody information, is still a major limiting factor for emotional VC. To overcome this limitation, in our proposed model, we outline the practical elements of the cross-wavelet transform (XWT) method, highlighting how such a method is applied in synthesizing diverse representations of F0 features in emotional VC. The idea is (1) to decompose F0 into different temporal level representations using continuous wavelet transform (CWT); (2) to use XWT to combine different CWT-F0 features to synthesize interaction XWT-F0 features; (3) and then use both the CWT-F0 and corresponding XWT-F0 features to train the emotional VC model. Moreover, to better measure similarities between the converted and real F0 features, we applied a VA-GAN training model, which combines a variational autoencoder (VAE) with a generative adversarial network (GAN). In the VA-GAN model, VAE learns the latent representations of high-dimensional features (CWT-F0, XWT-F0), while the discriminator of the GAN can use the learned feature representations as a basis for a VAE reconstruction objective. Abstract: It is well-known that a number of convolutional neural networks (CNNs) generate checkerboard artifacts in both of two processes: forward-propagation of upsampling layers and backpropagation of convolutional layers. A condition for avoiding the artifacts is proposed in this paper. So far, these artifacts have been studied mainly for linear multirate systems, but the conventional condition for avoiding them cannot be applied to CNNs due to the non-linearity of CNNs. We extend the avoidance condition for CNNs and apply the proposed structure to typical CNNs to confirm whether the novel structure is effective. Experimental results demonstrate that the proposed structure can perfectly avoid generating checkerboard artifacts while keeping the excellent properties that CNNs have. Abstract: A novel grayscale-based block scrambling image encryption scheme is presented not only to enhance security, but also to improve the compression performance for Encryption-then-Compression (EtC) systems with JPEG compression, which are used to securely transmit images through an untrusted channel provider. The proposed scheme enables the use of a smaller block size and a larger number of blocks than the color-based image encryption scheme. Images encrypted using the proposed scheme include less color information due to the use of grayscale images even when the original image has three color channels. These features enhance security against various attacks, such as jigsaw puzzle solver and brute-force attacks. Moreover, generating the grayscale-based images from a full-color image in YCbCr color space allows the use of color sub-sampling operation, which can provide the higher compression performance than the conventional grayscale-based encryption scheme, although the encrypted images have no color information. In an experiment, encrypted images were uploaded to and then downloaded from Twitter and Facebook, and the results demonstrated that the proposed scheme is effective for EtC systems and enhances the compression performance, while maintaining the security against brute-force and jigsaw puzzle solver attacks. Abstract: Automatic speech recognition (ASR) systems often make unrecoverable errors due to subsystem pruning (acoustic, language and pronunciation models); for example, pruning words due to acoustics using short-term context, prior to rescoring with long-term context based on linguistics. In this work, we model ASR as a phrase-based noisy transformation channel and propose an error correction system that can learn from the aggregate errors of all the independent modules constituting the ASR and attempt to invert those. The proposed system can exploit long-term context using a neural network language model and can better choose between existing ASR output possibilities as well as re-introduce previously pruned or unseen (Out-Of-Vocabulary) phrases. It provides corrections under poorly performing ASR conditions without degrading any accurate transcriptions; such corrections are greater on top of out-of-domain and mismatched data ASR. Our system consistently provides improvements over the baseline ASR, even when baseline is further optimized through Recurrent Neural Network (RNN) language model rescoring. This demonstrates that any ASR improvements can be exploited independently and that our proposed system can potentially still provide benefits on highly optimized ASR. Finally, we present an extensive analysis of the type of errors corrected by our system. Abstract: Laughter commonly occurs in daily interactions, and is not only simply related to funny situations, but also to expressing some type of attitudes, having important social functions in communication. The background of the present work is to generate natural motions in a humanoid robot, so that miscommunication might be caused if there is mismatching between audio and visual modalities, especially in laughter events. In the present work, we used a multimodal dialogue database, and analyzed facial, head, and body motion during laughing speech. Based on the analysis results of human behaviors during laughing speech, we proposed a motion generation method given the speech signal and the laughing speech intervals. Subjective experiments were conducted using our android robot by generating five different motion types, considering several modalities. Evaluation results showed the effectiveness of controlling different parts of the face, head, and upper body (eyelid narrowing, lip corner/cheek raising, eye blinking, head motion, and upper body motion control). Abstract: This paper reports a visible and thermal drone monitoring system that integrates deep-learning-based detection and tracking modules. The biggest challenge in adopting deep learning methods for drone detection is the paucity of training drone images especially thermal drone images. To address this issue, we develop two data augmentation techniques. One is a model-based drone augmentation technique that automatically generates visible drone images with a bounding box label on the drone's location. The other is exploiting an adversarial data augmentation methodology to create thermal drone images. To track a small flying drone, we utilize the residual information between consecutive image frames. Finally, we present an integrated detection and tracking system that outperforms the performance of each individual module containing detection or tracking only. The experiments show that, even being trained on synthetic data, the proposed system performs well on real-world drone images with complex background. The USC drone detection and tracking dataset with user labeled bounding boxes is available to the public. 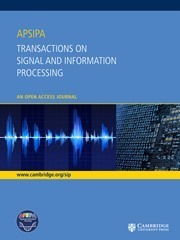 Abstract: In conventional studies, cryptographic techniques are used to ensure the security of transaction between a seller and buyer in a fingerprinting system. However, the tracing protocol from a pirated copy has not been studied from the security point of view though the collusion resistance is considered by employing a collusion secure fingerprinting code. In this paper, we consider the secrecy of parameters for a fingerprinting code and burdens at a trusted center, and propose a secure tracing protocol jointly executed by a seller and a delegated server. Our main idea is to delegate authority to a server so that the center is required to operate only at the initialization phase in the system. When a pirated copy is found, a seller calculates a correlation score for each user's codeword in an encrypted domain, and identifies illegal users by sending the ciphertexts of scores as queries to the server. The information leakage from the server can be managed at the restriction of response from the server to check the maliciousness of the queries. Abstract: In most of video coding standards such as high efficiency video coding (HEVC), I-frame assignment is periodic even when the content change is minor, which degrades the coding efficiency. This paper proposes an I-frame assignment method based on Nash bargaining solution (NBS) in game theory to solve this problem. The encoded sequence is divided into several subsequences. Each subsequence is regarded as a game. All group of picture (GOP) in a subsequence is further divided into several sets of GOP. Each set of GOP is regarded as a player and compete for the number of I-frames. The optimal I-frame assignment is determined based on the generalized NBS. Experimental results show the proposed method outperforms HEVC by 5.21% bitrate saving. Abstract: A large number of studies have been made on denoising of a digital noisy image. In regression filters, a convolution kernel was determined based on the spatial distance or the photometric distance. In non-local mean (NLM) filters, pixel-wise calculation of the distance was replaced with patch-wise one. Later on, NLM filters have been developed to be adaptive to the local statistics of an image with introduction of the prior knowledge in a Bayesian framework. Unlike those existing approaches, we introduce the prior knowledge, not on the local patch in NLM filters but, on the noise bias (NB) which has not been utilized so far. Although the mean of noise is assumed to be zero before tone mapping (TM), it becomes non-zero value after TM due to the non-linearity of TM. Utilizing this fact, we propose a new denoising method for a tone mapped noisy image. In this method, pixels in the noisy image are classified into several subsets according to the observed pixel value, and the pixel values in each subset are compensated based on the prior knowledge so that NB of the subset becomes close to zero. As a result of experiments, effectiveness of the proposed method is confirmed. Abstract: Voice conversion aims to change a source speaker's voice to make it sound like the one of a target speaker while preserving linguistic information. Despite the rapid advance of voice conversion algorithms in the last decade, most of them are still too complicated to be accessible to the public. With the popularity of mobile devices especially smart phones, mobile voice conversion applications are highly desirable such that everyone can enjoy the pleasure of high-quality voice mimicry and people with speech disorders can also potentially benefit from it. Due to the limited computing resources on mobile phones, the major concern is the time efficiency of such a mobile application to guarantee positive user experience. In this paper, we detail the development of a mobile voice conversion system based on the Gaussian mixture model (GMM) and the weighted frequency warping methods. We attempt to boost the computational efficiency by making the best of hardware characteristics of today's mobile phones, such as parallel computing on multiple cores and the advanced vectorization support. Experimental evaluation results indicate that our system can achieve acceptable voice conversion performance while the conversion time for a five-second sentence only takes slightly more than one second on iPhone 7.